Carneros Tasting Room Hours: 10:00 a.m. - 5:00 p.m.; Last tasting at 4:30 p.m.
A light filled space surrounded by waves of vineyards and stunning architecture, offering indoor and outdoor seated tastings. Brandlin is a Napa Valley estate that produces wine from a small, historic vineyard in the Mount Veeder appellation. The wines pay homage to the Brandlin family. As early as the 1870s, the Brandlins settled on these steep, rocky slopes, and became grape growing pioneers in Napa's Mount Veeder region. With over 50 years' of experience, Henry Brandlin staked the family’s claim to this estate and planted their own vineyards in 1926. In 1998 Cuvaison Estate Wines was honored by Henry’s son, Chester Brandlin, with rights to purchase Brandlin Vineyard. Respectfully maintaining the integrity of the estate, only a fraction of the land has been planted to vineyards carefully designed to honor the integral beauty of the property. Glens of old oak trees and sustainable viticultural practices support natural biodiversity and abundant wildlife. "We brought to Brandlin Vineyard all the lessons of Cuvaison Estate Wines' 38 years of viticulture - great care in the study of sun exposures and soil types, and profound respect for the environment. 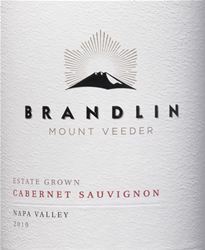 Our intention is to honor the Brandlin family with a namesake vineyard that produces intense and elegant Cabernet Sauvignon." Our historic winery location with a contemporary take on the classic tasting environment. An inviting tasting bar offers a warm and intimate experience. Tree shaded picnic grounds available. A light filled space surrounded by waves of vineyards, and stunning architecture, offering indoor and outdoor seated tastings. To join the wine club, visit www.brandlinvineyard.com or call 707-942-2455. Napa neighbors receive one complimentary tasting for each bottle purchase of Cuvaison or Brandlin wines, up to 4 guests. 10% discount on wine purchases. Valid Monday - Friday. Prior appointment is required.